With wearable devices that track every footstep and exercise milestone, Americans are keeping tabs on their own fitness like never before. Besides offering increasingly detailed data, companies like Fitbit are enhancing users' workouts through gaming and community-building. It's an inescapable lifestyle trend--and VCs are taking notice. Since the advent of the cubicle and the golden age of the vending machine, Americans, as has been widely noted, have been getting fatter. Some 90 million people are classified as obese, and many, many more are professional couch potatoes. The sad truth, uncovered in a study led by kinesiology researchers at the University of Tennessee, is this: The average adult takes just 5,117 steps per day--barely half the daily steps recommended by the U.S. Surgeon General. Belying our increasing girth is our perpetual willingness to try new ways to get in shape--and these days, many of those methods are digital. In fact, the Consumer Electronics Association says the sports and fitness category is a $70 billion annual business in the U.S. alone. The leaders in this market are companies manufacturing wearable devices for monitoring and tracking personal fitness levels; the gadgets typically operate in concert with phone or computer applications that provide analytics, encouragement and social media or gaming components. Demand for such products has been driven in part by the popularity of what is being called the "Quantified Self" movement, a term coined in 2007 by Wired editors Gary Wolf and Kevin Kelly to describe people with an interest in "self-knowledge through self-tracking." The opportunities are staggering. ABI Research estimates that the total number of wearable devices with fitness and wellness applications will grow from 16.2 million in 2011 to 93 million in 2017; it also predicts that revenue from sports and wellness mobile apps will rise from $123 million in 2010 to $341 million in 2016. Even the stalwart Weight Watchers is, at its core, a self-quantification company, with $1.8 billion in annual revenue. "Traditionally, it's been a market for enthusiasts, but it's being driven in consumer circles because of access to smartphones and a social trend around people leading healthier lifestyles," ABI principal mobile health and machine-to-machine analyst Jonathan Collins says. Hardbody hardware: The Fitbit Ultra packs tiny sensors that track and display activity metrics. Among the new tech companies at the forefront of the trend is Fitbit, a device manufacturer notable for its innovative, multiformat approach to fitness products and its rapid success in the notoriously difficult to crack consumer electronics market. Fitbit Ultra (the second-generation model released last October) is the top-selling health and wellness product at Best Buy, and its distribution footprint now includes Target, 24 Hour Fitness, Brookstone and REI. On Amazon, it's going head-to-head as the bestselling pedometer against industry giant Omron. Next up is an aggressive expansion into several European markets. Fitbit got its start after founders James Park and Eric Friedman sold their peer-to-peer photo-sharing company Windup Labs to CNet in 2005. While pondering their next move, Park, a former cross-country runner and avid swimmer, realized two things: that years of startup life had left him in terrible shape, and that he had the resources to come up with a solution. In early 2007, the two launched their fitness gadget company in San Francisco's Financial District, with Park as CEO and Friedman as CTO. The company's initial product, the eponymous Fitbit, was released in September 2009 as the first wireless wearable fitness device for the mass consumer market. 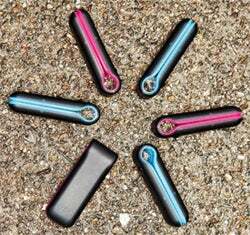 On the outside, the Fitbit (and Fitbit Ultra) is a black, thumb-size clip designed to be worn as discreetly as possible. On the inside, it's packed with tiny sensors that track and display various activity metrics: number of steps taken, distance traveled, stairs climbed, calories burned and an overall "active score," with about 97 percent accuracy. The device is charged via a docking station that connects to a computer USB port. Just carrying the thing around can be incentive enough to make a big difference for users. Fitbit's internal numbers show the average user takes 43 percent more steps per day; for those with weight-loss goals, there is an average drop of 13 pounds. John Barron, executive director at HealthCore, a research subsidiary of WellPoint, notes that early results from a yearlong obesity study show that in the first six months, 41 percent of Fitbit users lost five or more pounds; when a professional coaching component was added, participants lost an average of 7.5 pounds. But the device is only half the reason behind Fitbit's success. Equally important is its seamless, web-based dashboard experience (now extended to mobile), where the collected data is uploaded to show users exactly how much progress they are making toward a particular goal. There's infographic eye candy in the form of pie charts and graphs, progress bars and goal ranges. (Updated numbers are automatically pushed if the user is within 15 feet of the docking station.) Additionally, Fitbit boasts an active online community, as well as game mechanics like achievement badges and a leaderboard to facilitate competition and collaboration among friends. The system is addictive. The all-time top-ranked user, a woman in her early 40s, averages more than 20 miles a day (the theory is there's a treadmill desk involved); another woman in her 60s gradually increased her walking time on a quest to achieve the highest-level daily step badge, currently at 40,000. 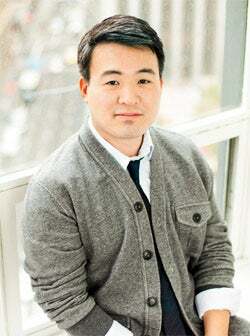 Practicing girth control: Fitbit's James Park. "We have a vision now of becoming the clear leader in personal health sensing," Park declares, alluding to much more to come in Fitbit's product portfolio--and soon--as the company spends down a $12.5 million funding round it closed in January. "Running a company is like playing a really great SimCity," says the 36-year-old Park, who didn't quite finish his computer science degree at Harvard but has the easygoing college-kid demeanor down pat, from his corduroys and casual polo to the striped green socks under his trendy kicks. "You set the right foundations in place, hire awesome people and move from office to slightly larger office and increase perks and amenities." It was not always so easy. When Park and Friedman, software engineers with zero background in hardware, started Fitbit, they lived and worked in an apartment the size of a small conference room, crammed with boxes. They had to find people who knew how to build hardware and could teach them about the mysterious world of supply chains, the tooling and the monumental risk involved in spending upfront money on a physical product whose design couldn't easily be tweaked. Indeed, the first Fitbits were almost a year late to ship, because Park didn't think the quality was up to snuff. Fundraising, too, was a lesson in perseverance. The first financing round of $2 million (quite small, considering $50 million isn't an outlandish budget for a gadget startup) didn't come until the end of 2008, when the company was nearly 2 years old. These days everyone wants in on the fitness-tracking trend, meaning shoppers have numerous brands and features to choose from, in the form of bracelets such as Nike's FuelBand and Jawbone's Up, or upper-arm devices, such as one from BodyMedia. Another startup, Basis, has come out with a smart-looking watch design that detects signals for heart rate, body temperature and motion. Fitbit, for one, is not sweating the competition. "We've got a comfortable lead, and the focus is on building the right product," Park contends, pointing out the redesigned Ultra ($99.95), with its laundry list of upgrades, including a better belt holster, new colors, a brighter LED display, "Chatter" messages that dole out personalized encouragement ("Rock on," "GOOOOAL," "Hug me") and new and better sensors. The device monitors sleep, and it is the first wireless activity tracker to include an altimeter that senses subtle changes in air pressure, allowing users to track how many flights of stairs they've climbed. And then there's the company's Aria Wi-Fi Smart Scale ($129.95), unveiled at the 2012 Consumer Electronics Show in Las Vegas, which is "closing the loop" on capturing, analyzing and understanding everyday health. It stands out as one of the most accurate scales at its price point for measuring weight, body fat and BMI (through a fancy process involving electrodes and indium tin oxide). Fitbit recently released an Android app in addition to its iOS one--the first fitness-tracker company to do so. Another core strategy is to embed the company into the infrastructural ecosystem of fitness tracking. Fitbit offers an open API that allows users to sync data with apps like Lose It!, RunKeeper and MapMyFitness, and even with competing devices like the Withings Wi-Fi body scale. Other partners include Massachusetts General Hospital, which is using Fitbit in clinical studies, along with corporate wellness agencies like ShapeUp and Limeade. Additionally, some companies, such as Red Bull, are encouraging use of Fitbit devices as part of corporate employee wellness initiatives. Until recently, VCs had cooled on health and fitness technology startups, mainly because of high regulatory costs and long fail cycles. The Quantified Self movement can be credited in part for a burgeoning new interest: Investment in mobile-based health companies rose from $233 million in 2010 to more than $500 million in 2011, according to MobiHealthNews. "It's the space to watch now that we've reached the point that the system is broken in a way that it's breaking the country," says Leslie Ziegler, self-described "chief evangelist" and co-founder of San Francisco Rock Health, the world's first seed accelerator for digital health startups. More than 700 applications were filed for 10 to 15 spots in the two most recent classes, and a Boston program was launched early this summer. The inaugural class finished up in November 2011 and includes Skimble, creator of the freemium Workout Trainer app, which provides an extensive multimedia library of content to help people work out when they can't make it to the gym. Another graduate is BitGym, which integrates game interfaces with cardio equipment; for example, it enlivens workouts on stationary bikes with videos that respond to body movements. But Ziegler, who considers herself a QS-er, says the jury's still out on fitness-tracking technology for the masses. Although entrepreneurs will surely invent better and more compelling ways to make data clinically relevant, she says she has yet to see a sustainable business model. Andy Smith came to the same conclusion. The CEO of online home-fitness video hub DailyBurn co-founded his company in 2007 as a service to track and encourage gym-going, amassing a respectable 2.5 million users over four years. But last December he switched the company's focus to streaming high-definition home-fitness videos, because he noticed that devices were being made redundant by smartphones and that tracker usage typically dropped off significantly after a few months. "My feeling on fitness is we should be developing technology focused on being the place where people go to do something, not just track what they do," he says, referring to some devices as "glorified accelerometers." Likewise, Fitbit's investors knew they were taking a risk. "It was an insane vision for a product, and startups have an especially hard time unseating incumbents in the consumer electronics space," says Jon Callaghan, a founder at True Ventures, which led Fitbit's first $2 million round and backs other consumer device companies like MakerBot Industries and Sifteo. At the time, Callaghan had already invested in several fitness companies, with middling results. But Fitbit struck him as a "big idea"--a new paradigm for a device. "It's always on, doesn't need to be plugged in and has the power to make data actionable," he says. "It makes the invisible part of your daily life visible, and as an investor who looks at the future, that was exciting." After that first funding round, Fitbit's momentum kept building; two more rounds followed (True Ventures participated in both), for a total of $23.5 million to date. Park is tight-lipped about Fitbit's official sales and user numbers but says the company tripled in size in 2011 and is expected to do so again this year. "We're accelerating exponentially," he claims, citing some of his favorite stats, such as the fact that since launch, Fitbit users have trod more than 80 billion steps. "There are many subtle things these guys got right," says Brad Feld, co-founder of Foundry Group, which led Fitbit's second, $9 million investment round in 2010. Fitbit is efficient with its capital and has a good track record of being first to market with smaller and more power-efficient technologies like the Ultra's altimeter. There's also an Apple-like quality to the product vision: one model for each line, with a focus on simplicity and integrated functionality, designed to appeal to as many people as possible. "We're trying to be the Nintendo Wii to the Microsoft Xbox," Park says, noting that success hinges on heavy investment in research and staying ahead of the latest sensor and micro-controller developments, in an era in which people not only own their own data, but also can use it to reach goals more easily than ever. "I can't claim I know where the future is headed, but I knew at the beginning that Fitbit was something I wanted," says Park, the picture of cheerful confidence, leaning back in his seat, hands on the back of his head, elbows splayed out like he's about to do a sit-up. "And when we did come out with the product, it took off like people had been waiting for it." He and his fellow device manufacturers have latched on to that demand and been running with it ever since.